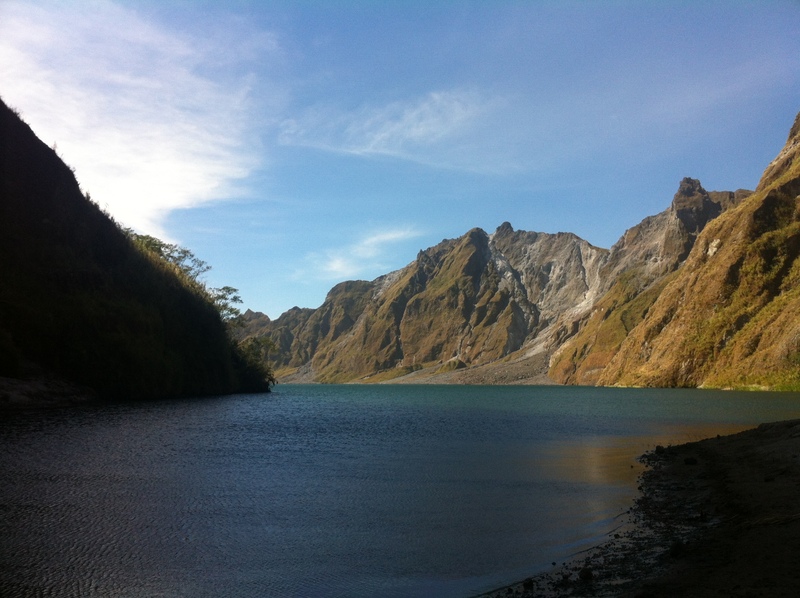 We went on an adventure two weeks ago, set off early morning to Capas, Tarlac to embark on a hike to the Mount Pinatubo crater lake. 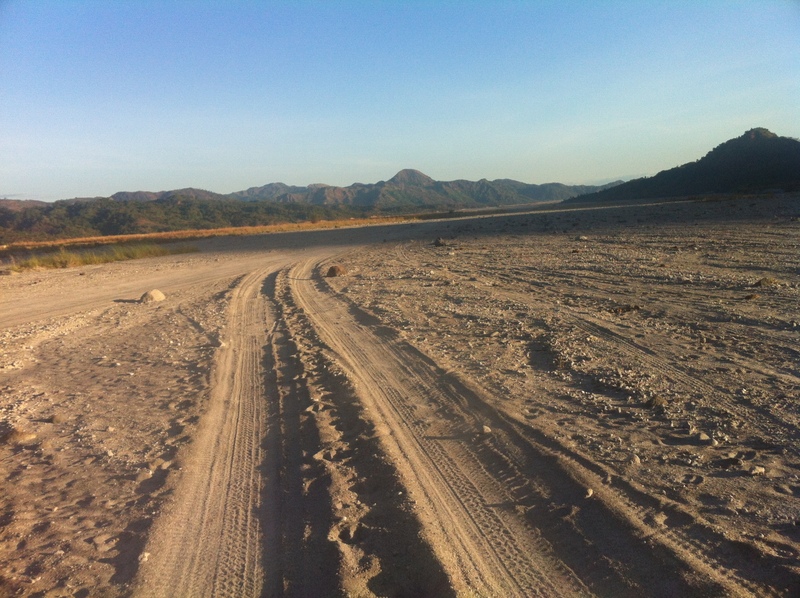 The base camp in Tarlac was about 2.5 hours drive from Quezon City (northern part of Metro Manila), sans the traffic, because we left before daybreak. At the base camp, we registered with the tourism office, with the help of our tour organiser. The payment to the organiser and the tourism office are usually paid separately. Once everything was arranged, we set off on a 4×4 military-style jeep across the lahar-laden terrain. After a 1-hour ride on the 4×4, the vehicle parked about a large open area, and we began our 7km hike on foot. Indeed, 7km seems not so very far, but if you consider that the terrain is all volcanic sand and rocks along the banks (or rather, criss-crossing) of a mountain river, and all uphill, you will realise that it is not a walk in the park. It took us about 2.5 hours to hike the entire 7km uphill. The climb was all worth it. The crater lake was a beautiful sight to behold. We arrived at the crater lake mid-morning, and was still fortunate to find some shade made by the rim of the crater along the banks of the lake. We had about an hour just to sit there in the shade, look out at the lake, and just relax. Just recently, they have already disallowed swimming in the lake. I think they just imposed it this January (2013), for a good reason. According to stories, someone died a few weeks (or months) back, not because of drowning, but because of poisoning after ingesting water from the lake. Besides the usual sulfur, the lake is also high in other heavy chemicals, especially Arsenic, which is well known as an instant poison. Near noon, the sun caught up with the crater and we had to seek shade, and then have lunch. There’s nothing to buy there, except for drinks which are P100 per bottle (about US$2.5, but honestly x3 of its regular price at the city). We brought chicken and rice meals with us for lunch, and different snack items we’ve been munching on throughout our climb. After about three hours at the crater lake, we already decided to start our descent. We went down the same way we came up, and somehow the descent seemed a little bit more difficult in terms of traversing the terrain. But speed and effort was not the problem, just the balancing while shifting your weight downwards on the rocks and stones. It was one hell of a leg workout. The return ride on the 4×4 was extremely dusty too, mainly because the terrain was a lot drier than during dawn, and there were a number of other vehicles ahead of us. It is good to have a shawl to cover the mouth and nose, and shades to cover the eyes. Covering for the head/hair is helpful too. Try to look online for discounter vouchers. 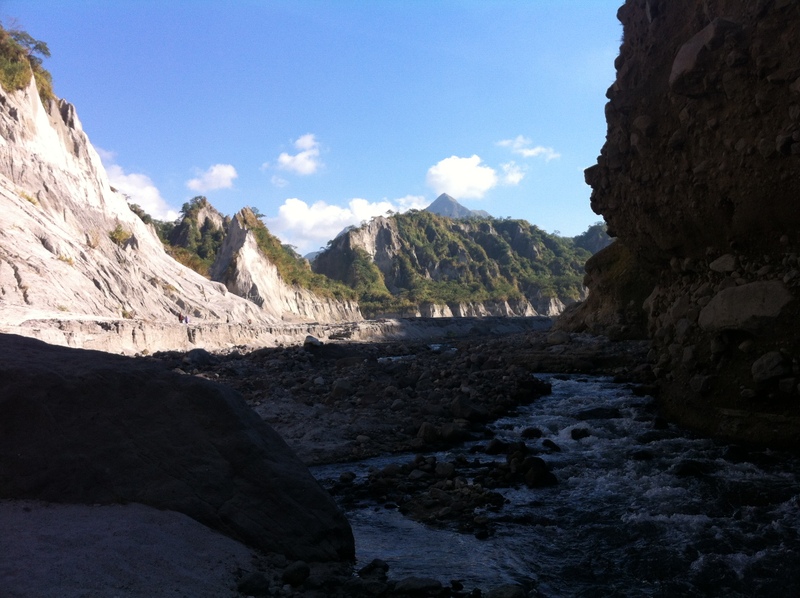 Or just research online the different groups and companies that organise trips to Pinatubo. Sometimes, the packages can include the transportation from Metro Manila, and even the meals. As for us, we chose to bring our own vehicles and bring our own food. My life is back to normal. At least, it’s an entirely different kind of normal from the normal I’ve been used to for the past few years. I’ve somehow chosen a different kind of life to live now. I’ve given up the luxury of driving to and from work five days a week. Gone is the 1.5++ hour drive (one-way) to and from work, and the thousands of pesos spent monthly on gasoline charges and other car maintenance expenses. I am back on the daily commute. I’m back to working in my comfort zone, my timezone. It’s about two-thirds of the distance I used to travel every day. My new work is a short walk from the MRT station. I take the MRT everyday now, going to work in the morning and coming home in the evening. I then take a shuttle after MRT in the evening, and take a leisurely walk (under the stars) from the village gate on my way home. I try to pack my lunch everyday too. I make myself a yummy sandwich, enough to fill me at lunch. When I don’t get to pack my lunch, I buy a sandwich at a nearby convenience store. It costs a lot less than what I used to eat for lunch, and has a lot less calories too. Work is both something old and new. I’m starting to get into the groove again. The project I’m doing now is pretty interesting and challenging, enough to give me just the right push to give my best, as I always would like to do with whatever I do. My personal life is also warming up too. 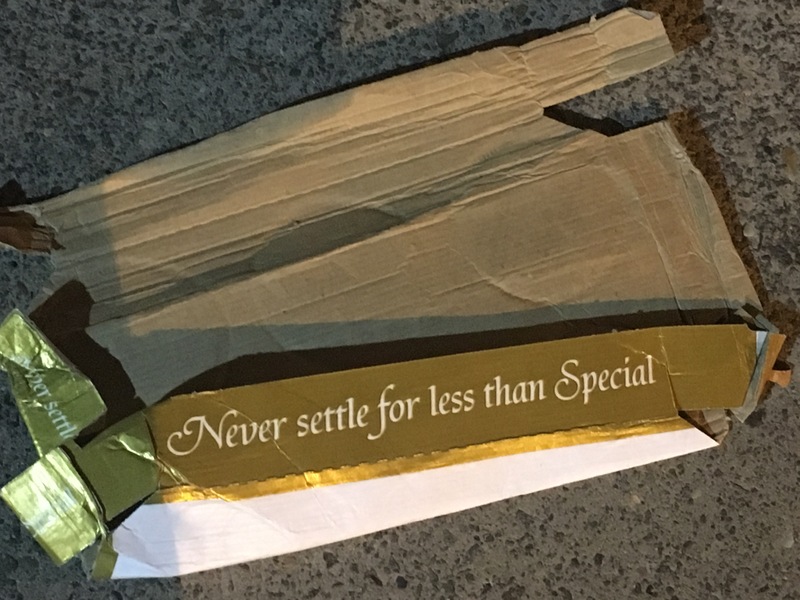 No lovelife yet, though. I’m just loving the time I have on my hands to write blogs, do errands, read books, study/review on some topics and interests, pamper myself, relax and meditate, and opportunities to do many other things. There’s just something that feels really nice about the new kind of normal. There are less expenses, less calories, more walks and physical activities, more time to just look around and observe the real world, and more time to be me again. I guess I really needed this change. A better me everyday, that’s the goal. Sometimes it happens in small moments, in baby steps. Sometimes it happens with long strides, or with some jumps. This time, it was a leap for me again. I’ve landed, and am back on the ground, but this is an entirely different land already. Time to continue walking. 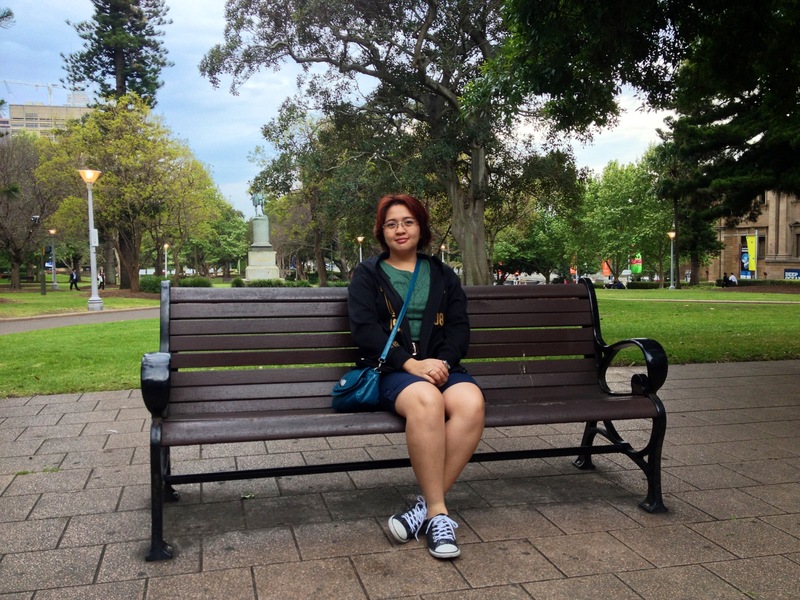 I had almost two weeks in Sydney during my trip to Australia. The purpose of our trip was mainly to visit my brother, but we included a lot of sightseeing. There is just so much to see around Sydney. It was good that my brother’s place where we stayed is smack in the middle of the city. He has a condo along George Street, and if I understand correctly, it’s one of the main roads within the city. Almost everything was within walking distance and we were able to take advantage of this. Hyde Park was two blocks away. It was a wonderful big park, although I don’t know how else to describe a beautiful park besides mentioning the nice big trees, the lush green grass, and the amazing fountains, and the lovely park benches. There was also a small war-memorial museum on one side of the Hyde Park. On one end, you can already see the St. Mary’s Cathedral. It was just a good place to walk to and around. The Town Hall was right beside the condo, although we never took time to have a look inside. 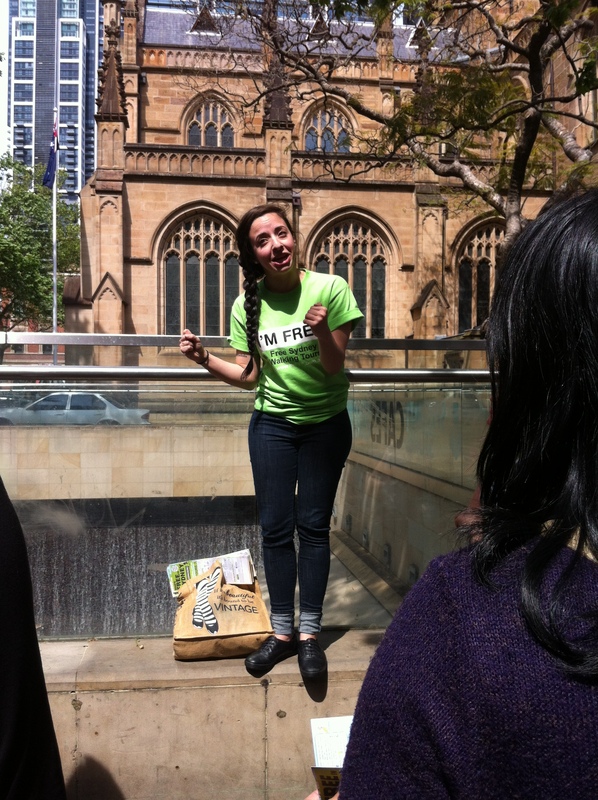 However, there is a free walking tour around downtown Sydney that starts infront of the Town Hall twice a day. 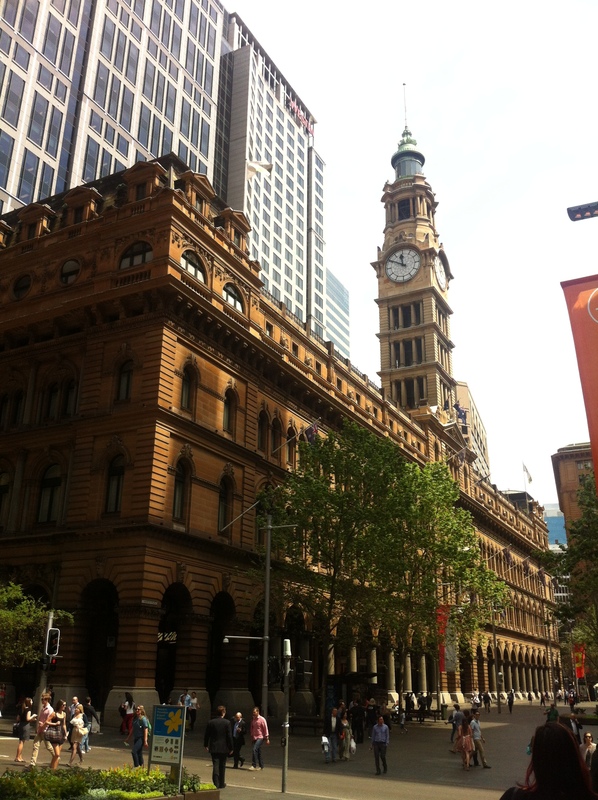 We joined one walking tour one morning, and it showed us around the different sights and structures around the George Street area, ending at the edge of The Rocks, near the Circular Quay. The entire walking tour took around 3 hours, but it was a very leisurely walk, together with a crash course in Sydney history. Sydney structures and architecture are beautiful, and something different to me. Their old buildings are very ornate, reflecting such a rich history as a Commonwealth colony. It’s good that they are able to preserve a lot of these buildings downtown, if not all. The Queen Victoria Building (QVB) building was pretty interesting too, the way it has been re-purposed to be a high-end mall, and yet retaining that old-English vibe. It is a wonderful mix of the old and the new. The Westfield mall was also close by. 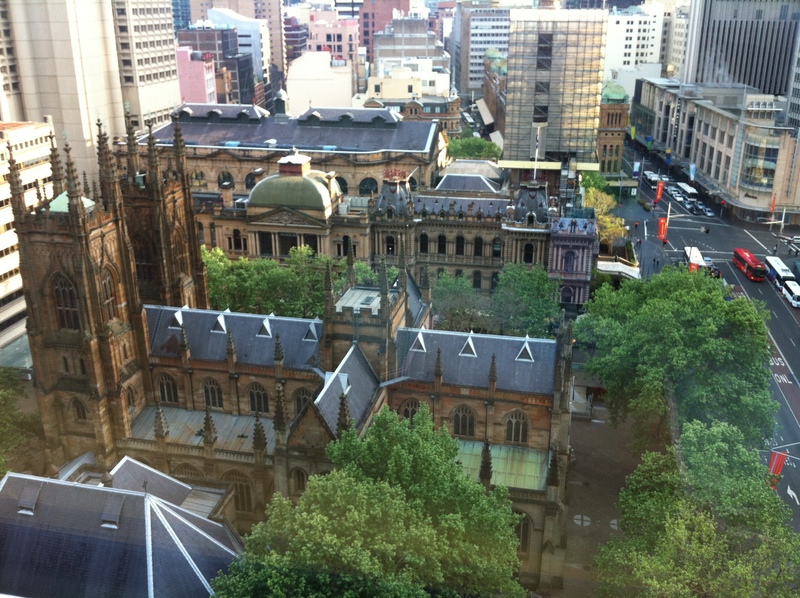 You can practically get from QVB to Westfield and Pitt Street through the basement shops. Westfield is their big, high-end mall. They have mid-range stores at the lower levels, and a good food court at one of the upper levels. You can also access the Sydney Tower Eye through Westfield mall. Paddy’s Market and Chinatown was also around the vicinity. Although their Chinatown is not as “Chinese” as the other Chinatowns I have visited, here in Manila and in Singapore, it was also a pretty interesting area. Paddy’s Market is a covered, flea-market style retail area, and there are also a lot of things you can find there, both dry goods (clothes, household items, toys, souvenirs) and wet goods (fruits, vegetables, and meat). It’s a good place to buy souvenirs and “pasalubong” (take-home gifts for family and friends). The Circular Quay is a long walk or a short bus ride away. From there, you can take a ferry to most of the ports around Sydney. It also gives a good vista of the Sydney Opera House and the Sydney Harbour Bridge on opposite directions. Unfortunately we did not have the time to go climb the Harbour Bridge, nor walk to the Sydney Opera House. 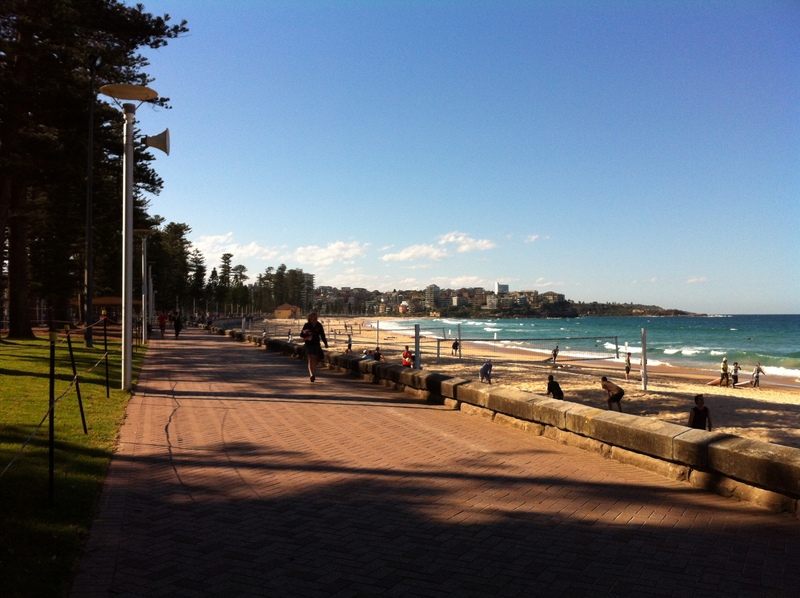 We did, however, take a ferry to Manly Beach and explore the area. Manly Beach is a good place to hang out, sunbathe, swim, and surf, and it’s pretty near the city and very accessible via the ferry. 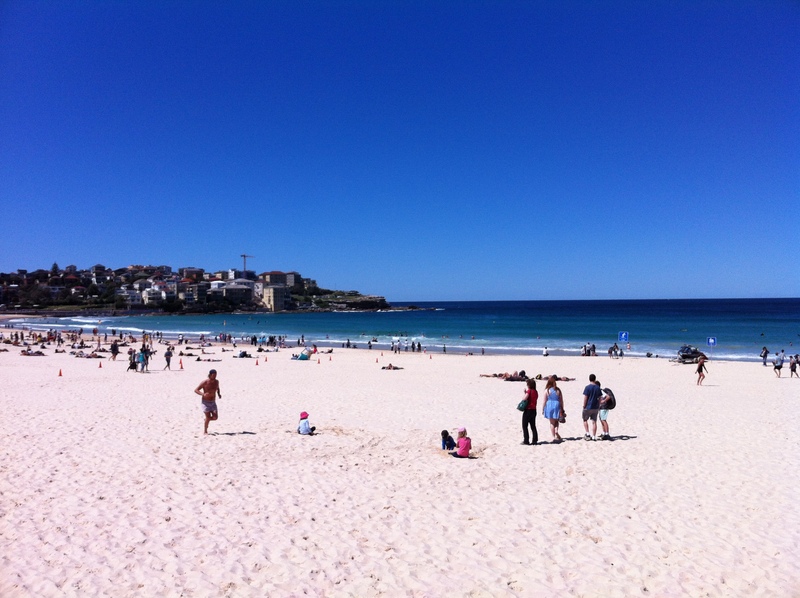 Speaking of beaches, we did go to Bondi Beach, but it’s a bit of a drive from the city. We did not get to swim because it was pretty cold during that time, but there were number of Aussies doing their sunbathing. We decided to settle around the grassy area and have a picnic. We also got to walk around the area, with a number of food places and stores around. 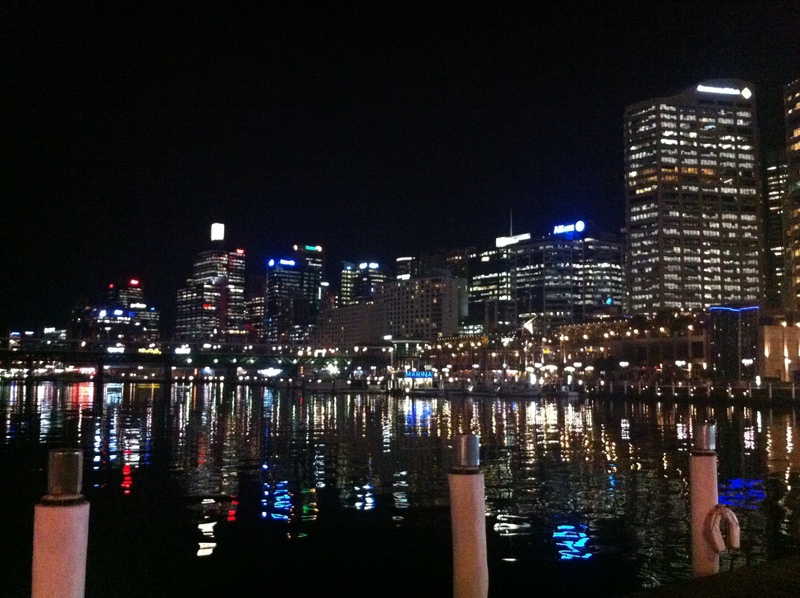 Darling Harbour was also a short walk from my brother’s place. Darling Harbour is a busy area but also relaxing in a way. There are a few museums around Darling Harbour including the Maritime Museum and Madame Tussauds along the harbour, and the Powerhouse Museum a short walk away. We did not go to any of the museums though. I went on a solo walk there one late afternoon and just spent some time around the Tumbalong Park and beside the harbour. On another occasion, I was there with the family and we had dinner as we waited for the Saturday evening fireworks. Whatelse? Hmmmm… Maybe I should also mention Woolworths (or Woolies!) right across Town Hall. We were getting foodstuff from Woolies almost every day, and it was just a tumble away from the condo. Perhaps if I had more than two weeks in Sydney, I would be able to see more and explore more of the city and the nearby suburbs. I would also be able to spend more time with the extended relatives. Aye, I’ll definitely be back, I’ll find a way. I think the museum team may have caught the fitness bug. 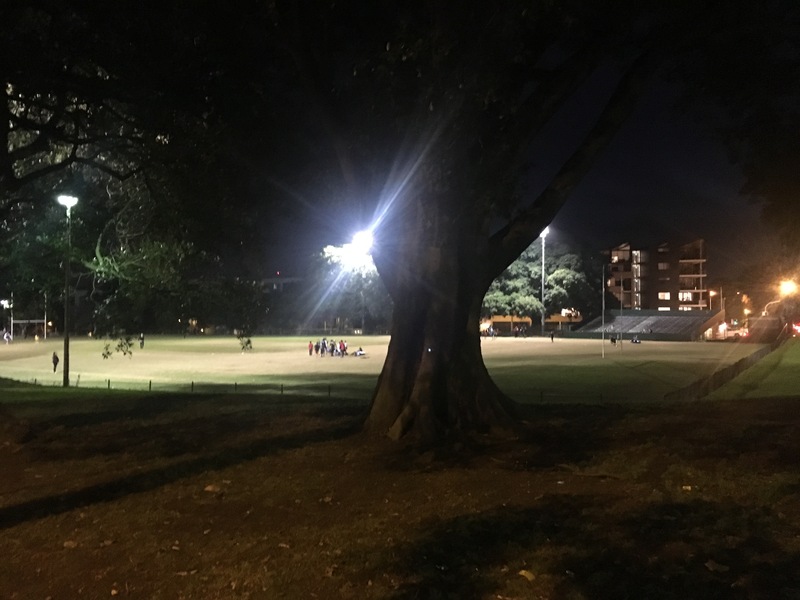 A few people from the team have already started attending fitness camps after work hours. More than 20 of us got a 15-day pass to a yoga place that is opening soon. Small groups have been running or swimming once a week. The office fridge is now filled with a number of milk cartons of all types, and the pantry cabinet filled with different kinds of cereals. I must admit, though, that I sort of started the milk-and-cereal trend in our pantry. I have a carton of non-fat high-calcium milk and a box of high-fibre cereals in the pantry (with my name written all over it, literally). I also try to go brisk walking at least once a week, though I don’t usually do it with other people. I’m back to yoga too, and hoping to stay active in yoga at least once a week. In short, I am one of the people in the museum team with the fitness bug. It’s good though. It’s good to be in the company of health enthusiasts, not to mention, a group far from vices (unless you consider Jollibee Coke Float a vice, hehe). I have a long way to go in terms of fitness. My heart does not allow me for high intensity cardio workouts (and even mid-intensity would still leave me knocked-out), and so I have to find a good fitness regimen that has low-intensity cardio but will still help me reach my targets. I’m hoping that regular brisk-walking and yoga would do the trick. I also need to find a diet that I can stick to, hopefully something that won’t leave me hungry or craving, but satisfy my hunger pangs without the excess calories. I still have to lose N lbs. (where N>10).